In just two years, head coach Mike Zimmer has brought a winning culture to Minnesota. His tough, smart, and aggressive approach is starting to change the future of the organization. Nonetheless, through Zimmer's eyes, there will always be unfinished business. Every game coached by Mike Zimmer starts with a handshake. As all 46 active players stretch before the game, Zimmer extends his hand and acknowledges each of them. Zimmer knows how to bring the best out of his athletes. He is a straight-shooter, but nobody cares more about his players than Zimmer. He's a true players coach. However, he's learned not to take anything for granted along his NFL journey. 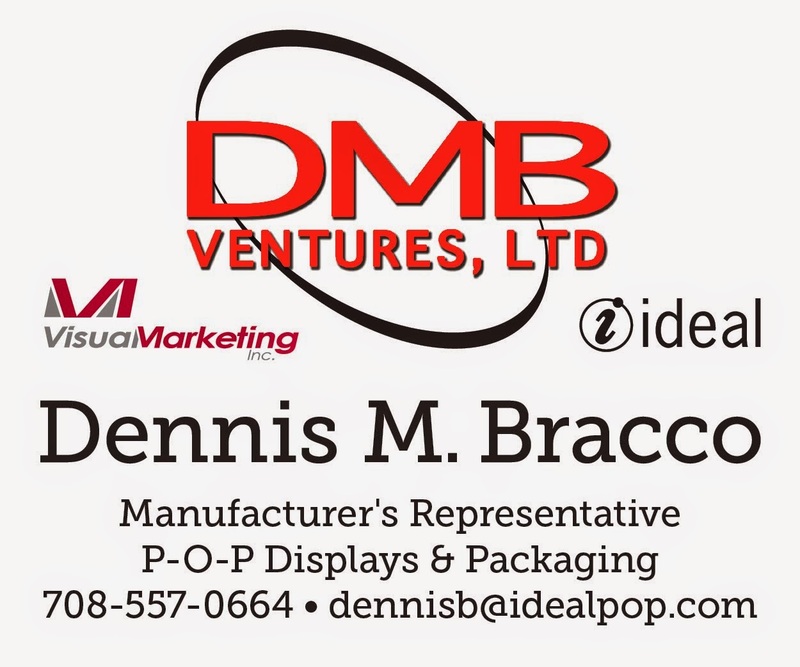 It took almost 30 years for him to land this opportunity, but he isn't using that as motivation. Bringing home a championship to Minnesota is the only thing on Zimmer's mind. "I want Vikings football to be a tough, smart and aggressive team that plays with passion and that works relentlessly for one common goal. I want our fans to be proud of the way we play - tough, resilient, physical football and a team that makes big plays and represents them on the field and in the community." Zimmer inherited one of the worst defensive units in the history of the Minnesota Vikings organization. In 2013, the defense ranked last in nearly every defensive category and finished 31st in total defense. They allowed the most points per game (408), passing yards per game (287.2), and allowed the second-most total yardage (6,362) to opposing offenses. 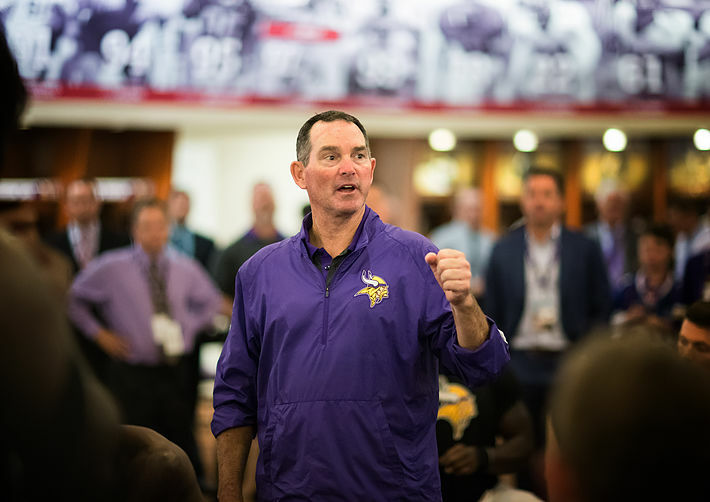 Zimmer vowed to the organization, fans, and players he would change the culture of the organization. "I fix stuff. I am going to...fix this," Zimmer said at his introductory press conference. Many analysts projected this "fix" would take years to develop. 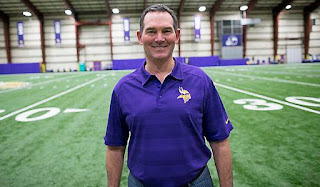 Zimmer took to the fields of Winter Park with the full purple coaching outfit and a black whistle dangled on the outside of his neck. He didn't stand on the side and take the approach of a boss who lets his employees do all the work. Zimmer was in the middle of all the positional drills, shooting instructions to the players as they began their work for the year. Months later, he took to the steamy practice fields in Mankato, MN as began the construction of a winning football team in Minnesota. At every training camp session, Zimmer was hands-on with players like Xavier Rhodes and Sharrif Floyd. He was vocal and taught them the technique and fundamentals of the game. Zimmer convinced all 53 players to buy into the system he was implementing on both sides of the ball. Not to mention, he assembled a staff of coaches that could provide growth within each position group. Zimmer surrounded himself with people who could push this team towards a winning product. 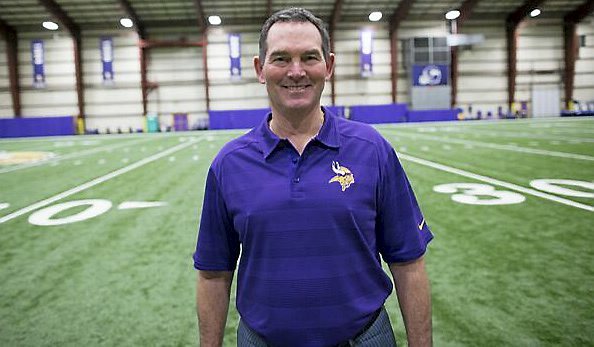 "I pride myself in making each player better with technique, and teaching them every aspect of the game," Zimmer said. 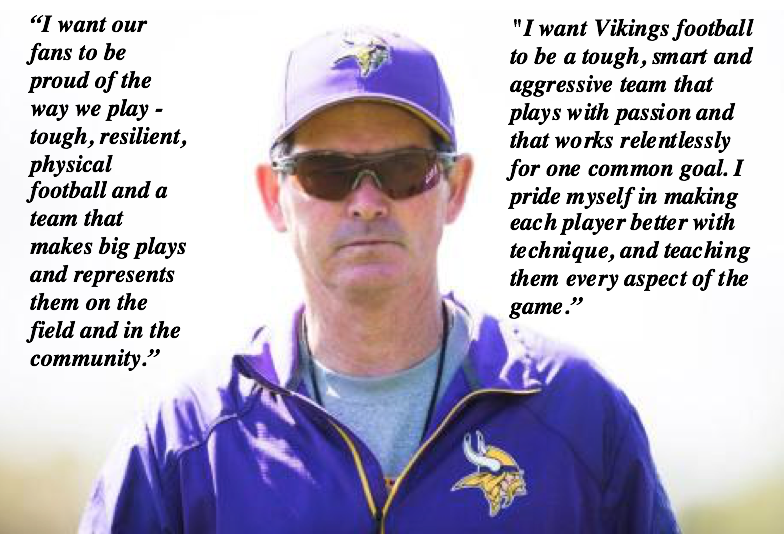 The results of this philosophy have shown as you evaluate the young talent on the Vikings' roster. In his first year as head coach, Xavier Rhodes developed into a physical cornerback, Sharrif Floyd was formidable in the interior, Harrison Smith was an enforcer, and Anthony Barr became an athletic specimen in Zimmer's system. Every player Zimmer comes in contact with on the defensive side of the ball is being utilized to their full potential. Jerry Gray is motivating the defensive backs, Adam Zimmer is coaching up the linebackers, and Andre Patterson is grooming young pass rushers. 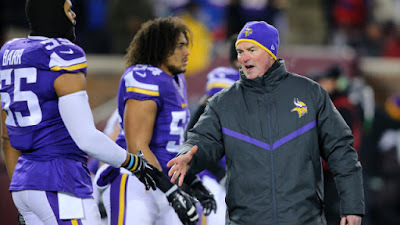 All of those coaches are cut from the same cloth as Zimmer -- they are teachers. 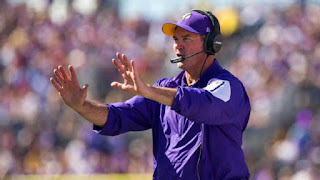 On the offensive side of the ball, Zimmer hired offensive guru and former NFL head coach Norv Turner to run his offense. Norv Turner brought over 35 years of coaching experience to that side of the ball. Upon Zimmer's arrival, Matt Cassel and Christian Ponder were the current quarterbacks on the roster. Just months after being hired, Zimmer and Turner evaluated the quarterback prospects in the 2014 NFL Draft. They traveled to pro-days and seen the the likes of Blake Bortles, Johnny Manziel, and Teddy Bridgewater. However, one athlete caught their eye. Teddy Bridgewater was a player they both envisioned could develop into a franchise quarterback in Minnesota. He was a down-to-earth, poised, and driven individual. As analysts ripped his 'lackluster' pro day, the Vikings coaching staff smiled. In May, other quarterbacks flew off the board, but Minnesota traded into the bottom of the first round to select Bridgewater. They were going to work hard to develop a franchise quarterback they could build their franchise around. abuse charges in Texas court. Zimmer was thrown into the fire with a struggling defense, a suspended star, the Chris Kluwe/Mike Priefer scandal, and a young quarterback. How did he handle that? He embraced it. As his coaching mentor Bill Parcells told him, "Four or five things happen in pro football every day that you wish wouldn't happen. If you can't handle those, you need to get another job." He handed the reigns to Teddy Bridgewater just months after being drafted into the NFL. There were growing pains early in 2014, but Bridgewater quickly started to gain confidence. He completed 64.4% of his passes for 2,919 and 14 touchdowns. His completion percentage of 64.4% was the third-best in history by a rookie signal-caller. His passer rating of 85.2 was the seventh-best. Then, he was on fire for the last five weeks, completing 68% of his passes. Over that same stretch, he averaged 72% completions and 8.79 yards per attempt. What's more, according to Pro Football Focus, Teddy Bridgewater's accuracy under pressure (75.2%) was the best in the league and the highest single season score since 2008. Aside from developing a young quarterback, Zimmer and his coaches revitalized the Vikings defense. A historically poor group in 2013 turned the corner under the direction of defensive-minded head coach Mike Zimmer. He improved nearly every defensive statistical category except for rush defense. Zimmer would resolve that issue in 2015 because that's what "fixers" do. 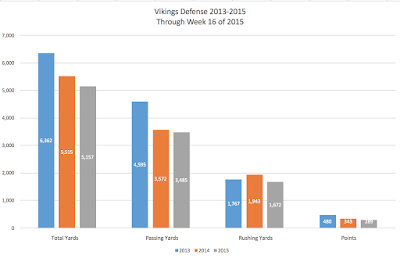 In 2014, the Vikings improved their pass defense and drastically trimmed their points allowed. Below I have compiled the differences between the 2013 and 2014 defensive units. 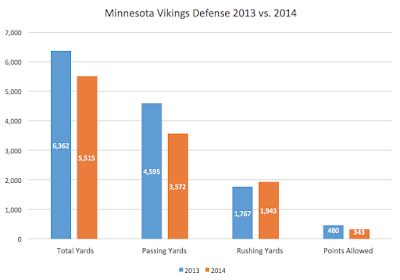 The chart shows how Zimmer's first year running the defense resulted in a considerable cut in total yardage and passing yards. Additionally, he drastically trimmed the total points allowed. 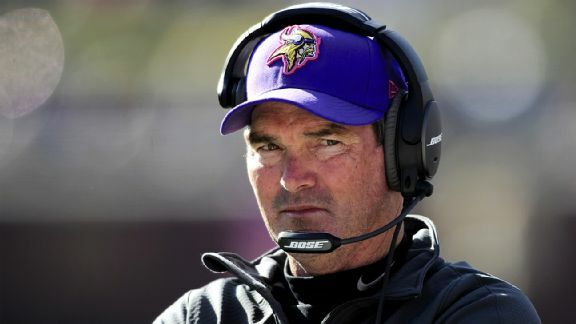 Despite some of the drama that surrounded the team in 2014, Zimmer led the Vikings to a 7-9 overall record. They lost four games by a total of eight points or less and showed plenty of resiliency. The Vikings were on the rise and needed to find a few additional pieces to take their squad to the next level. What's more, the Vikings went into the offseason knowing they needed to find ways to win in the division. They knew a 1-5 divisional record wouldn't take them where they want to go. 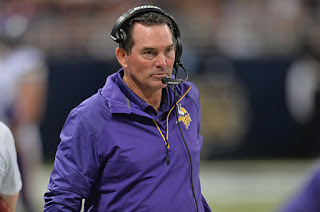 Mike Zimmer took the offseason to build upon the success the Vikings defense exhibited in 2014. General Manager Rick Spielman and Zimmer evaluated the performance of the team and added talent in the offseason as the Vikings made a push towards the playoffs in 2015. The Vikings supported Adrian Peterson throughout his suspension and he would return to their roster. Zimmer added more tools to continue the development of his defense. They drafted developmental project CB Trae Waynes in the first round and paired him with athletic linebacker Eric Kendricks. In the third round, they added athletic pass rusher Danielle Hunter. They selected offensive tackle T.J. Clemmings in the the fourth round and took a chance on wide receiver Stefon Diggs in the fifth round. How did all of these selections work out? The answer is: better than anyone could have imagined. Trae Waynes has yet to start, but is a developmental project in the making. The Vikings signed Terence Newman in the offseason to give Waynes more time to develop. It took Eric Kendricks until week six to see starting action. He hasn't looked back since. Danielle Hunter is second in total sacks among rookies and is seeing a rise in playing time as the Vikings make a push towards the playoffs. T.J. Clemmings was thrust into the starting role after Phil Loadholt's season-ending injury and has done admirable with limited overall experience at the tackle position. Finally, Stefon Diggs, is leading the team in total receiving. He's emerged as an energy injection for the Vikings offense down the stretch. All of these names prove how this group of coaches are teachers. General Manager Rick Spielman has the luxury of finding raw players who fit within the system. He has complete confidence that Zimmer will use his resources to make them into ball players at the next level. The Vikings have changed their culture to an aggressive, physical, and smart group. They have built their team through the draft and are on the rise with a young nucleus of players that have bought into Mike Zimmer's philosophical beliefs. Little did Zimmer and Spielman know how much this young talent would take their team to the next level in 2015. It also wouldn't hurt to have MVP running back Adrian Peterson back on the field with another year of experience under Teddy Bridgewater's belt. 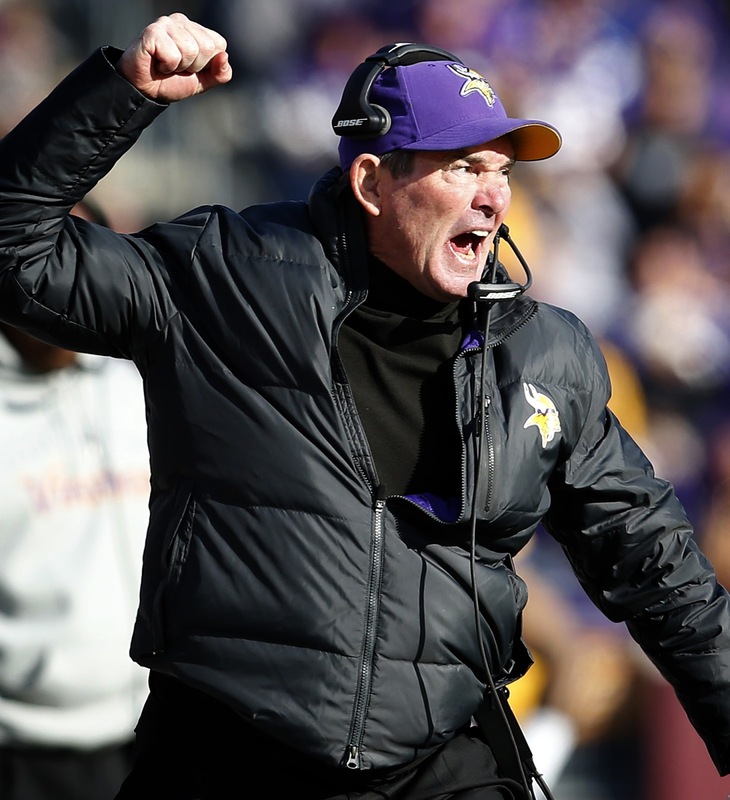 Entering 2015, many analysts saw the Vikings as a wild-card playoff team. Mike Zimmer saw even more. He had his eyes set on a division championship since the Vikings took the field for training camp in July. "With the team that we have and the youth that we have, I thought it was important that they see some things that gave them the opportunity to do the things that they're doing right now." The Vikings started the season on the hallowed grounds of Canton, Ohio in the Hall of Fame Game. Mike Zimmer wanted his young team to take a walk through the historical building before they started the season. They toured the Pro Football Hall of Fame and each player learned more about the game they play each Sunday. 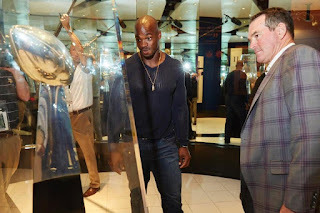 Adrian Peterson stopped at the Lombardi Trophy and Mike Zimmer looked on with him. They both stared at something the Vikings haven't hoisted since the inception of the franchise in 1961. The Vikings kicked off their season with a 14-3 win over Pittsburgh and came home with an appreciation for the players who came before them. They knew what was necessary to capture that trophy and championship that each player strives for in the NFL. They honored Mick Tingelhoff and started the season by playing a brand of football he would be proud of. The Vikings dominated the preseason and flashed the promise their young group of players had as they entered the regular season. They opened the season in San Francisco as part of the Monday Night Football doubleheader. San Francisco fired Jim Harbaugh, lost several key defensive players, and Jim Tomsula was beginning his first season as a head coach. Most NFL experts saw the Vikings walking away with a convincing win to open the 2015 campaign. However, they couldn't stop running back Carlos Hyde, who rushed for 168 yards and two touchdowns against the Vikings defense. Teddy Bridgewater was just 2-of-5 for nine yards and he took two sacks on nine third down plays. The offense converted no first downs through the air and the Vikings were obliterated on national television. That loss might have been the best thing that could have happened to this young Vikings squad. They realized nothing comes free in the NFL and you have to bring your best effort every week to compete for a title. Following the loss, the Vikings woke up and crushed both the Lions and Chargers at home. They traveled to Denver and lost a close game, but went into the bye with a .500 record. The defense was producing and now the offense needed to start catching up. The Vikings had the bye week to reevaluate their goals and returned with a totally different attitude. Out of the bye, the Vikings rattled off five consecutive wins, including three road games. They knocked off Chicago on the road for the first time since 2007 and started to change the culture of their team. Minnesota entered the home matchup with Green Bay at 7-2, with a chance to take over the division lead. Penalties and miscues squandered this chance and the Vikings were walloped 30-13 at home. Following that loss, they traveled to Atlanta and knocked off the Falcons. However, injuries started to add up and the Vikings played Seattle and Arizona without four defensive starters (Barr, Joseph, Sendejo, Smith). Seattle took advantage and knocked off the Vikings 38-7. The bad news came when Minnesota had to prep for a short week against Arizona. Without all of those starters, the Vikings had the ball with a chance to tie the game against the Cardinals. A strip sack fumble squandered the victory and Arizona won 23-20. Nonetheless, the Vikings moved the ball offensively and were starting to become a balanced offense. Adrian Peterson was running wild and Teddy Bridgewater was flourishing as the Vikings started to use more quick rhythm passing. Following the close loss to Arizona, Minnesota started to get healthy and rattled off two dominating wins over the Bears and Giants. They outscored New York and Chicago 87-37 and punched their ticket to the playoffs. Now, they've set up a winner-take-all week 17 matchup at Green Bay for the NFC North Title. Three years ago, this idea seemed like a figment of a man's imagination. Mike Zimmer has used various motivational tactics for this 2015 squad. Many analysts have criticized the Vikings for being unable to win divisional games, win on the road, or win in primetime. The Vikings have put all of these phrases to rest. They are currently 4-1 in NFC North games after finishing 1-5 a season ago. They are 4-3 on the road after finishing 2013 with a 0-7-1 record away from Minnesota. In 2014, they won just two road games, but quickly doubled this amount in a matter of a season. Finally, entering the New York Giants game, the Vikings were just 3-18 in night games since 2009, including the playoffs. They improved this total by destroying the Giants in primetime, 49-17. Furthermore, they continue to improve defensively as 2014 free agents Linval Joseph and Captain Munnerlyn get familiar with the system. Not to mention, the development of the young talent is starting to mold the Vikings into one of the top defensive units in the league. Below you can see the progression from Leslie Frazier's defense to Mike Zimmer's over the last two years. The Vikings have conquered almost every developed storyline. Their next one is the phrase: "can't win against the Packers." Until the Vikings find a way to win against their division rival, they won't have a chance at the NFC North. Their final matchup with Green Bay to close out the 2015 season can win them their first division title since 2009. All of this comes as construction crews feverishly finish U.S. Bank Stadium in time for the 2016 season. Mike Zimmer is bringing the Vikings back to prominence before our eyes. He deserves to be in the conversation for Coach of the Year, but Zimmer is all about his players. He has his eyes on a bigger prize: bringing Minnesota its first championship. It might not come this year, but he's positioning the organization towards years of dominance. Winning a division title in Green Bay and hosting a home playoff game is the next step towards building this organization. However, no matter what happens over the next month, Mike Zimmer has the Vikings on the rise as they continue their quest towards NFL immortality.